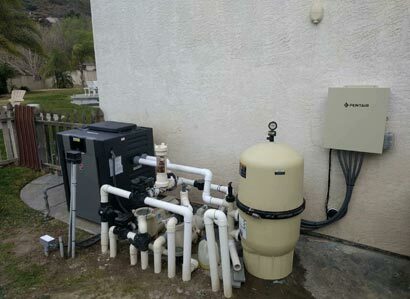 This swimming pool owner in Lakeside, Ca was interested in replacing the pool heater and installing pool automation. They were interested in the new pool heater installation as their old pool heater was not heating properly. Our customer wanted to make sure that the new pool heater will work when they wanted and needed it to. They often use the spa for therapeutic reasons and did not want to have it fail when needed. This is why they opted to perform a pool heater upgrade rather than trying to have us perform a pool heater repair. They were very interested in installing new pool automation to simplify the use of their pool and spa. They often would forget to turn off the system or they would not turn all of the valves in the proper direction. 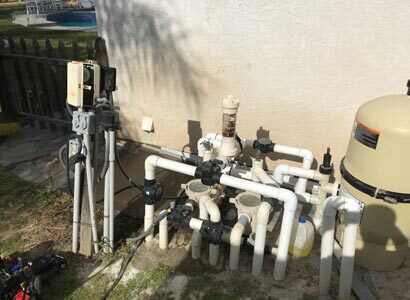 By installing new pool automation, it will prevent them from having these issues in the future. By installing the new Pentair EasyTouch pool controller, everything will be controlled by their smartphone or wireless pool controller. Now, this Lakeside swimming pool owner can turn on the hot tub or spa when out to dinner or on the way home to reduce the time needed to use. As with most pool heater upgrades, we used the Raypak 406A pool heater. This is the best pool heater made and will stand up to the elements and time. This pool heater is also an atmospheric heater which means it does not use a blower. A blower is used on all other pool heaters to vent the heat chamber. Not that those types of pool heaters are not good but, Raypak pool heaters are better. There is a time where we will recommend a different heater and that is when there is a space issue or that access is very difficult. Otherwise, we are recommending and using the Raypak pool heater for all pool heater upgrades. 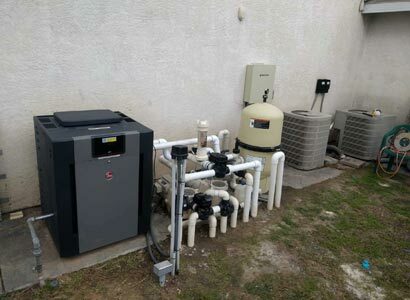 When installing this pool heater in Lakeside, CA, we know that the customer will have a reliable, long-lasting pool heater. This Raypak pool heater is also able to have a pool heater repair performed without having to worry about access to parts. Whenever Raypak pool heater repairs are necessary, parts are very obtainable as the design of this specific pool heater has not changed much in design. As with the pool heaters we recommend, we also highly recommend the Pentair pool automation line of products. When it comes to Pentair EasyTouch pool controllers, they are the best of the best. We can say this as with our many years of fieldwork, we know that these pool controllers hold up to time and the elements. There are many manufacturers out there but Pentair is the pool automation that we install 90% of the time. We will install any type of pool automation but if our client is asking for our recommendations, it is Pentair pool automation. 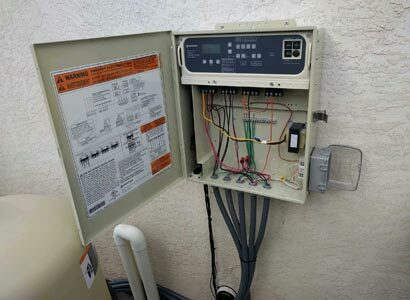 This Lakeside pool automation upgrade will allow the customer to have better control of their swimming pool and hot tub. Unlike the manual pool system where you need to walk outside and turn valves, turn on the pump, and then turn on the pool heater. And once done going back outside to turn everything off and re-rotate the valves. This new Pentair EasyTouch Lite pool controller included the installation of the ScreenLogic functionality. Screen Logic is added so that you have full control of your swimming pool and spa with your smartphone or tablet. As stated earlier, this gives you the ability to access your pool equipment at any time. Turning on the hot tub when out to dinner or on the way home from a trip. This pool automation upgrade gives you the easiest way to operate your swimming pool and makes changes on the fly as needed. The Screen Logic also allows you or your pool service technician the ability to look into any issues you may be having with your pools operation. If you are looking to upgrade your pool heater or add pool automation to your pool and spa, we can help. We also perform complete pool equipment repairs and new pool equipment installations for all of San Diego County. Regardless of the make or manufacturer, we can fix your pool equipment or replace it. Feel free to give us a call or fill out our contact form and we will be happy to help however we can.